Celebrating the CBSA Stars of 2015! Update: We have held ceremonies celebrating the Stars across the country this spring/summer. Further details are available in an article Stellar CBSA Employees are Shining Stars for the Canadian Society of Customs Brokers. Let's meet the twenty six CBSA Stars of 2015 and their nominators. Amber Cromwell of Pacific Customs Brokers Ltd. recognized Nanette Anderson. "[Ms. Anderson] has helped numerous times with shipments after hours that were major priority shipments, like releasing oyster seeds that were going to perish within a few hours. I had called six different numbers for Air Canada & Customs multiple times; she was the only one who answered and who got the shipment released in time. It seems she is the only officer that ever responds when assistance is required. Also in another scenario she helped me clear a live Albion shipment at YVR at 10 pm, which I had to do as paper package due to an error with the airline. I feel like she goes the extra mile whenever help is needed. I greatly appreciate her assistance." Barb Miller of Expert Customs Brokers recognized Brad Berdusco. "Brad has been instrumental to Expert Customs Brokers at [Kingsgate] port. We clear a lot of produce out of this port for a client that is not far from the border. The client will not leave their facility until the shipment is Dec Accepted. We have had many issues with delays and the agents not processing correctly. Some delays have been in excess of 12 hours. We have been given many reasons but when we started to go over the heads of the agents we continually got Brad and he was amazing. Not only did he help with those shipments but has continued to help with every delay. He has also given us his cellular in case there are lengthy delays that are not being resolved. Most recently a delay for 12 hours was brought to his attention. Brad not only followed up but has done so a couple times to confirm what was going on. Together we have even come up with a process on how to address any issues and came up with a mutually agreed process that is understood on both sides. His attention to ensuring that CBSA standards are met is remarkable. In addition any times agents are giving poor responses or saying they do not know, Brad is taking that as a training opportunity to avoid it happening in future. Brad is very reasonable to deal with and always works to an agreed outcome. We truly wish all CBSA staff were as great as Brad!" Sherry Cosier of Pacific Customs Brokers Ltd recognized Monte Couse. "Officer Couse is one that has straightened out several concerns that have come about and has no problem taking the time to explain exactly why and how. He willingly takes anything on and makes sure that the answer or actions are fair and always consistent." Sherry Cosier of Pacific Customs Brokers Ltd recognized Byron Hill. "Byron is very approachable, fair and always willing to provide guidance. We enjoy working with him and trust that our clients are always provided the same level of service each and everyday when working with Officer Hill." Natalia A. Atchison of Pacific Customs Brokers Ltd recognized Kevin Stebbings. "I find [Office Stebbings] to be extremely helpful in every aspect. He's always willing to go above and beyond whenever we have problems that need to be resolved. He is my go to whenever we've needed to get things done, or will make sure it gets handled right away. He's super easy to get along with and very friendly, which I think is important since we work so closely together on a daily basis." Jackie Fraser of A.D. Rutherford International recognized Diane Delorme. "I would like to nominate Diane because of her tireless effort to ensure the commercial/trade sector of the port of Boissevain is running smoothly. She has taken the time to create an SOP (standard order of procedures) binder for all BSOs to reference. As the only broker on site, I have seen time and time again Officers referencing the book to ensure they are processing correctly. Diane is an officer that is not afraid to keep asking until she gets an answer, I have yet to see her give up and state "That is not my job". As the port of Boissevain does not have a set Commercial Officer or a clerk Diane has taken it upon herself to know the ins and outs of each and every process the officers may encounter. When the emanifest program was coming into effect Diane was quick to ensure the non-automated ports would have access and training to release an ACI emanifest. The non-automated ports of Boissevain were not even equipped to release an emanifest until weeks before it became mandatory. Her efforts to learn the entire process, keep asking questions, pushing when answers were required was remarkable. She then offered to go out and train each of the officers to ensure they understood the process. Diane is an officer that will always answer your questions or concerns. If she doesn't have an answer she will keep asking until she has one to provide. She works tirelessly to ensure all commercial entries/outstanding are cleared up as soon as possible. She is one of the hardest-working and most motivated border services officer I have ever met and have had the honor to work with. I strongly feel Diane should be recognized for everything she does." Bob Cowie of GHY International recognized Theresa Gerelus. "Theresa has been a valuable resource with regards to providing valuable information related to Duty Drawbacks as well as helping us understand the difficult rules related to the Least Developed Tariff requirements especially related to the textile rules. Always responds to a phone message or email in a timely fashion. CBSA is fortunate to have such a caring person as part of their team to educate on Compliance and make one be aware of the risks and liabilities related to Compiance." Jacques Phaneuf of UPS-SCS, Inc. recognized Larry Wong. "I first dealt with Mr. Wong back in 2013, when I first presented a B2 Blanket to correct HS for a client. Since 2013 we have presented several more requests. Over the years Mr. Wong has been very helpful and understands the meaning of service within the CBSA. We are in constant communications and its always a pleasure to deals with him, he is polite, professional and he understands our challenges as Customs Brokers." Shelley Gares of Canadian Society of Customs Brokers recognized Daniel Anctil. "When I worked in the brokerage business, [Mr. Ancil] never failed to respond. If my question was not related to his area of expertise, he always gave me direction on who I should contact and then circled back to ensure that I had what I needed. Pretty respectful. In cases that did fall under his expertise, he gave a full and timely answer." Diana Mihaila of LEI Customs Brokers recognized Nick Leonard. "When it comes to SIMA everything is blurry, Officer Leonard shed a lot of light on many concepts for us. He is great." Angela Collins of Willson International Limited recognized Debbie McGuire. "We have recently opened a new office in Vancouver and my team was responsible for arranging the addition to our brokerage license. Sounds easy, read the regulations, fill out the forms, send them to CBSA and off we go. Well, not so much! We sent our application package off to Ottawa and a couple of days later I received a phone call from Ms. Debbie McGuire. Yes, that is correct, she phoned me. We reviewed what was submitted in our application, she explained what we still needed to provide and also that the application would have to be sent directly to the port where we were planning on operating, something that was overlooked when reading the D-memo. She kindly couriered my package back to me, followed up with an email and provided a contact to me in the Metro Vancouver District. This unto itself was a pleasant and memorable experience. Well her efforts and assistance didn't end there. Our surety also sent the bond addition to Ottawa and again it ended up with Ms. McGuire. Again, Ms. McGuire picked up a phone and called me regarding this. Rather than wasting time sending the documents back to me, she sent it directly to the correct person in Vancouver. The reality here is it would have been easier for Ms. McGuire to return the package to us and simply state incomplete. I have to say that Debbie McGuire, (Senior Programs Officer, Commercial Registration) was truly a great resource to me throughout the process and I truly appreciated her pleasant attitude, knowledge and assistance. Based on my experience with Ms. McGuire I think she would be an excellent candidate for the CBSA Stars." Chris Cartan of Universal Logistics Inc. recognized Kimberly Batten. "[At Universal Logistics], we have always found Kimberly to be very personable and easy to work with. Kimberley responds promptly to inquires and provides thorough follow up. Kimberly has always been very helpful but one case in particular stands out. We had an issue with a transaction, that required us to file a K84 Accounting Override request. Correcting this was not only important to our company but important to our client. With concerns that a clerical error could prove costly to our client, Kimberly thoroughly reviewed what was a complex transaction. Once Kimberly understood the issue, she gave us the assurance that the correction would be made and later took the time to let us know the correction had been accepted, by following up with a phone call. Kimberly’s exemplary service was greatly appreciated by our company and our client." Melanie Bedard of Milgram & Company Limited recognized Kamaljit Lotay. "I had the opportunity to work with Kamal over a long period of time on a drawback claim that was quite challenging. Her knowledge and way of working were very impressive as well as the high level of professionalism displayed throughout the process. She is interested in educating and ensuring that the client is on the right track for future claims to ensure a quicker turnaround and more efficient process and was a pleasure to work with." Tracey Gaydos-Manning of UPS-SCS, Inc. recognized Kevin Northcott. "Kevin will monitor our multiple shipments for us and inform the officers to monitor as well. If we have specialty shipments we will call Kevin and he will do what he can to get them released. He really is an overall godsend to UPS. He does a fabulous job for us every day. He is very helpful and always pleasant." Aurelia Wong of EDI Customs Brokers recognized Anson Williams. "I would like to extend our appreciation to Officer Williams in helping us on a time sensitive RMD correction. Numerous attempts were made to fix the issue but not until we got hold of Officer Williams did we get the incident resolved. His quick response and understanding helped our client deadline delivery." Tanya Dietrich of Farrow recognized Diane Boismier. "Diane works at the eManifest support desk. She has a vast knowledge and understanding of CBSA regulations. She is patient, friendly and fair. She is always willing to listen and help find a solution for any problems from eManifest, commercial and casual importation, CLVS clearances, and more. If Diane does not have a solution to the problem she goes out of her way to find a solution. She has been a great help to Farrow Logistics and other brokers in the area." Janice McBride of Canadian Society of Customs Brokers recognized Elisha Hurlock. "Customs brokers are Canada’s most knowledgeable trade chain partners when it comes to border management. As such they are enthusiastic consumers of information relating to new initiatives and this can make them a “tough” crowd. When we decided to focus on eManifest Notices at our 2015 national conference, we were introduced to Elisha Hurlock who at that time was working at CBSA HQ. From the moment when Elisha first began to explain the outline of her presentation, we knew that everything would be just fine. Presenting to customs brokers requires a deep level of subject matter knowledge. You really can’t just read from some slides. During her presentations and the related question and answer periods, Elisha clearly delivered the information needed and was able to effectively respond to the concerns of delegates. In our conference evaluations, she was recognized for the value that she conveyed to attendees. Thanks Elisha for understanding your audience and delivering exactly what they needed to learn about eManifest Notices." John Brooks of Farrow recognized Cathy Walters.
" Ms. Walters is an officer of long standing at the London CBSA office. In her different capacities over the years we have interacted in various ways and she has consistently demonstrated deep knowledge and effectively applied her experience in understanding each of the various issues being dealt with. It has been my experience that this is an officer whose advice and direction I can trust and rely on with confidence. Most recently our paths have crossed in the Advanced Ruling process and the positive experience has been sustained albeit in most cases via email. An amusing personal anecdote also involved Cathy. Some time ago it was necessary to make an inquiry via the BIS ultimately to receive a call from Cathy. We had to chuckle because it was Cathy who had initially advised me that she could not answer my question and that I needed to go through BIS!! In summary, Cathy Walters is a highly knowledgeable and personable individual who I am very happy to nominate as a CBSA Star." Maria Palmer of UPS-SCS, Inc. recognized Kathy Weaver. "[Superintendent Weaver] has been such a help with each startup of eManifest. Working with us when things weren’t going well, digging in to find out what the problem is and how she was going to fix it so we were able to be compliant as well as maintain service to our customers. Honestly, we would have had some very hard times without her helping and teaching us." Bobby Markose of UPS-SCS, Inc. recognized Tanya Macleer. "Tanya's expertise helps to navigate everyday challenges when we face system issues or concerns with clearances. Sometimes the situations are complex but she assists every time including processing voluntary disclosures. Without her help we would have had delays in servicing our clients promptly." Lorin Levine of Action Customs Services recognized Dieter Paprotny. "Mr. Paprotny is handling a trade compliance verification of one of my importing clients, and it has grown to be a very large and complex case in classification of great many parts in various catalogues of different shippers. As the broker we were brought to the table very late (two weeks after the interim report was issued). As we scrambled to get up to speed, Mr. Paprotny has been extremely cooperative, has taken every phone call, and answered emails very promptly. In the final report he addressed every point we made in our comments, and provided his method of thinking and analysis along with his reasons or rebuttal for a re-determination in detail. We have had an opened, clear, and fruitful discussion and intelligent debate on the merits of various classifications according to what the goods actually are compare to details contained in explanatory notes and chapter and section notes, and while the sample size of the audit was small, we have completed a system sweep and voluntarily cleaned up of many items. He further encouraged us to appeal where we felt it merits an appeal and apply for advanced rulings for items not contained within the audit sample. As we have been pressed for time given the number of entries and lines to amend, he has been further helpful in fast tracking the blanket B2 process as well as receiving voluntary amends bit by bit as they have been processed. Overall much appreciated above and beyond cooperation on a large and complex case, has been a win-win for both parties." Bobby Markose of UPS-SCS, Inc. recognized Martine Rheault. "Martine's expertise helps to navigate everyday challenges when we face system issues or concerns with clearances. Sometimes the situations are complex but she assist every time including processing voluntary disclosures. Without her help we would have had delays in servicing our clients promptly." Rachid Lakhal of UPS-SCS, Inc. recognized Chantal Timothée.
" During an audit of import transactions for one of our clients, Mrs. Timothee showed a perfect sense of customer service and an open mind in order to get an administrative decision made with respect to customs regulations. Mrs. Timothee listened to our comments and suggestions while assisting us with the necessary regulatory research." Laura Swanson of Willson International Limited recognized Richard Tremblay. "Mr. Tremblay has been extremely helpful in verifying our understanding of CBSA regulations pertaining to the interpretation of specific rules of origin and other complex Customs regulations. His attention to detail and complete responses are greatly appreciated. In this complex, high speed Customs environment, it is essential that we respond to our clients' questions or concerns in a timely manner. Richard Tremblay has this sense of urgency and provides regular updates until the issue has been fully addressed. While written Customs Rulings are useful, they cannot always be obtained within the importer's timelines. Richard’s vast knowledge and genuine desire to provide the answer and full explanation is a much needed asset in the partnership between CBSA and Customs Brokers. While we all can agree that being helpful and polite is part of the job description, we have found that it is rare that we actually find an officer that will research a topic in order to provide an answer instead of just telling us to apply for a ruling. Mr. Tremblay is one of those rare people." Aurelia Wong of EDI Customs Brokers recognized Charlene Haughn. 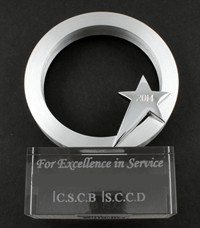 "I would like to take this opportunity to thank all CBSA staff members at St. Croix. Every time I call, they are extremely helpful and polite. Special thanks goes to Charlene, she is always able to provide solutions and will go “over and above” to help wherever she can. Her prompt assistance and professionalism is much appreciated and that goes to her team as well." Raymond Collins of PF Collins International Trade Solutions recognized Kelli Philpott. "Kelli consistently goes above & beyond. She is very approachable, friendly and pleasant. She works WITH us to answer our questions, simple or complex. If she doesn't know the answer, she goes the extra mile to find it or to provide direction on where to go next. Kelli is always helpful and we appreciate her very much. She is a great asset to the CBSA team in St. John's, NL." To view articles on past Stars and ceremonies, please refer to 2012, 2013 and 2014.